Author MaritaPosted on February 12, 2014 February 12, 2014 Categories EmpowermentTags create your life, empower your life, empowerment tips, how to achieve life goals, how to achieve your life goals, how to make a vision board, visionboard. I love Brian Tracy! I think a great way to get to our goals is to visualize them. I don't have any tips to share, but I definitely like his. If we can't imagine where we want to go, how are we going to ever get there?? Great post! Thanks Heather I love Brian Tracy too, he is great and easy to understand. Thanks for passing on the visualization tips. Good stuff! Creating a visual is something that we rely heavily on being a food company. Loved the visualization exercise, great post! Thank you Crystal, I love your food visuals, they make me want to eat. Great post! Thanks for the tips! I usually write down what I visualize too, and read it daily. 🙂 Thanks for sharing! Good for you , that’s a great habit! This is a great post, and I, too, love Brian Tracy! I can't say that I've done this on a regular basis until about eight months ago. I work in a fast paced industry and wasn't giving myself the time I needed to take care of me. After taking some time off and making several adjustments, I'm finally at a place where I put myself first…afterall, where will I go without me! He is one of my “mentors”. Great that you are listening to your body and spirit and giove it a rest. If we don’t we burn a fuse! 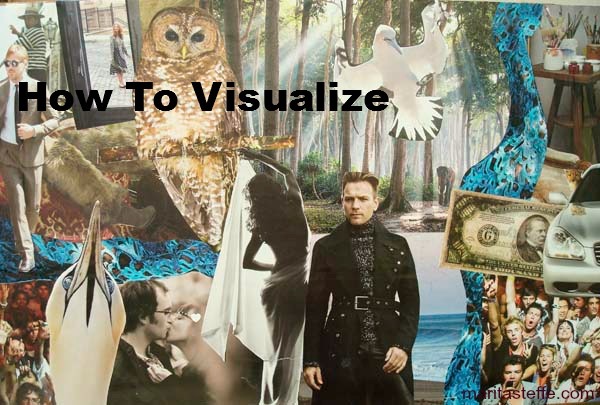 I had the most bizarre experience lately with visualization — having a difficult time imagining, as real, the abundance I wanted to bring into my life. And then I remembered a photo I have used before. It shows a beleaguered woman about to be crushed by a mountain of paper behind her. For some reason, I was able to take what was essentially a negative image and reimagine it with a smiling me surrounded by a mountain of money. Amazingly, it worked. Often, when people find it difficult to "visualize" something, doing exactly what you did makes all the difference! Take the negative and turn it into what you WOULD like it to be instead! It is amazing! Thank you Cheryl, yes it always amazes me how effective these simple practices are. This is one way I do relax I do love it! I need to do it more so that my “visualized dreams” come true! Great tip, I love it! It is true, you've got to see it and believe it! Great tips! Brilliant article with lots of helpful tips. I think Brian Tracy is great. Oh yes, definitely! It's critical to continue feeding our minds with positive thoughts/imagse. The more we do, the more we reinforce the attitudes needed to create success. I like how you broke it down into exactly HOW one can visualize! Great article! It's like a postivite reaffirmation exercise and a great habit to get in. Thanks for the extra steps and explanation! Great tips! This is one of the many reasons I do yoga. It is incredible how much it helps me with visualization for both my personal and professional lives. Thanks for sharing Marita.